HMS Dreadnought (Royal Naval Museum) HMS Dreadnought, named after a ship of the line at the Battle of Trafalgar , gave her name to a revolution in naval warfare. Built in Portsmouth dockyard in just over a year, she was the best-armed and fastest battleship in the world when completed in 1906. At a time when battleships usually mounted only four big guns and an array of smaller weapons, Dreadnought's ten big 305mm guns made all other battleships out-of-date. Powered by new steam turbines she had a top speed of 21 knots, 3 knots faster than battleships with traditional piston engines. 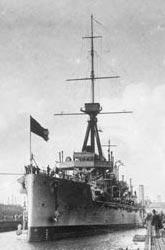 Dreadnought was the idea of Admiral Sir John Fisher who became First Sea Lord in 1904. Fisher wanted to replace battleships with fast all-big-gun armoured cruisers, called battlecruisers, which could deal with both battleships and cruisers. Armour was not as important as big guns that could penetrate any armour at long range. Fisher's colleagues at the Admiralty were not so revolutionary, so Fisher gave in and built an all-big-gun battleship, Dreadnought, instead. In the same way as HMS Warrior almost fifty years before, the construction of Dreadnought was intended by Fisher to deter Britain's enemy, in this case Germany, through a demonstration of technological excellence and to indicate that any challenge to British naval supremacy would be futile. Notes: The armour belt was the protection along the sides of a ship's hull. The barbette was an armoured cylinder below the turret which protected the ammunition hoists and the turret's turning mechanism.